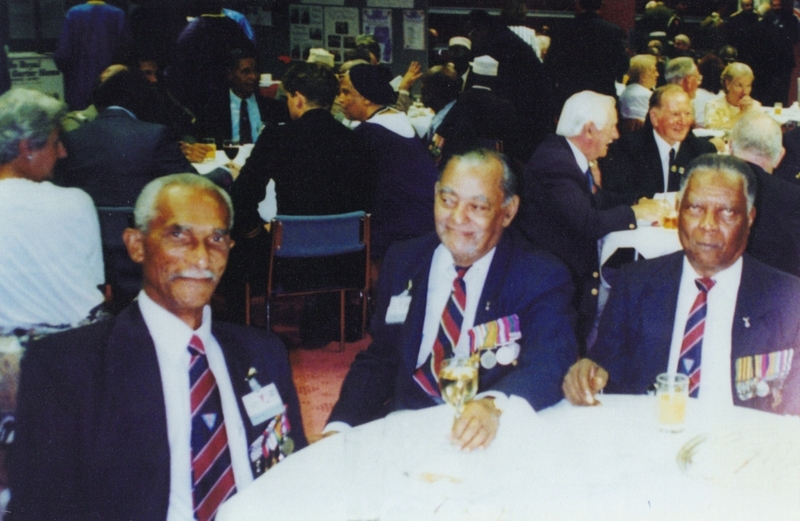 VE-dinner, London 1995, from left: John Blair, John Ebanks and an unidentified veteran. 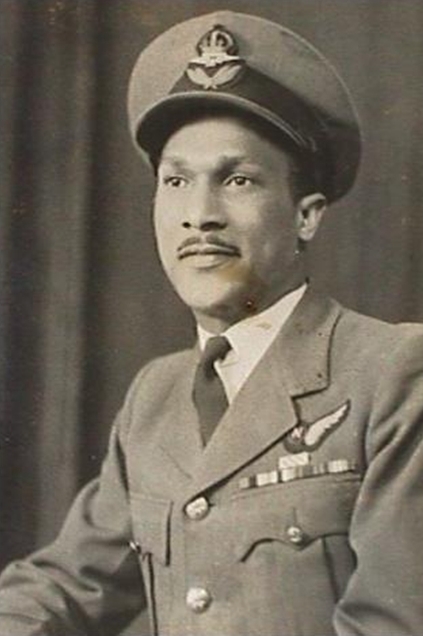 Mark Johnson talks about his great-uncle John Jellicoe Blair, one of almost 500 Black Caribbean air crew in the RAF during the Second World War. 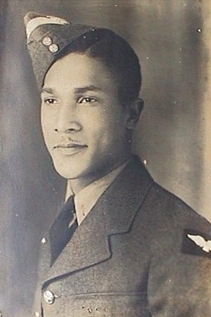 Flight Lt John J Blair, DCF, volunteered for the RAF from Jamaica in 1941. 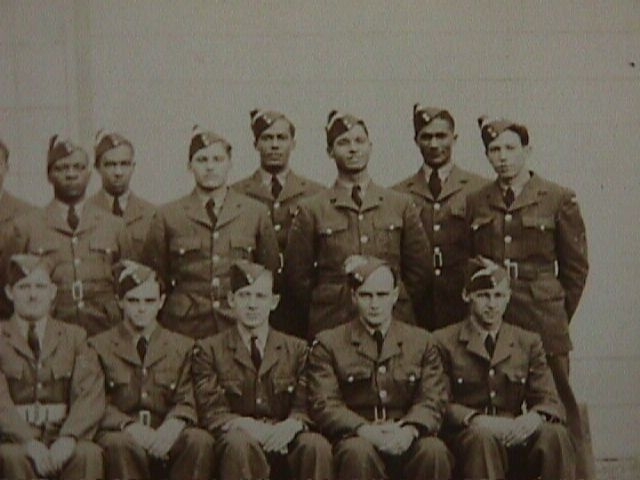 After training at Monkton in Canada, as well as at RAF Kinloss in Scotland, he was assigned to 102 (Ceylon) Squadron in December 1944. 102 were stationed at Pocklington, Yorkshire and John flew as a Navigator in Halifax bombers from December 1944 to the end of the war in Europe, and was involved in many of the main bomber raids during the period. His Squadron, with he served with Flt Sgt LO Lynch, was joint third for the heaviest casualties suffered by any RAF squadron during WW2. 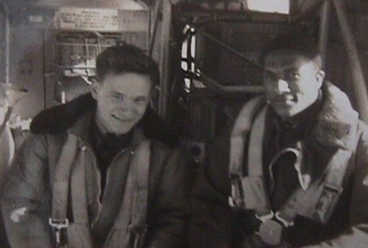 In the six weeks after he joined the Squadron, a total of 8 aircraft were lost on operational duties over Europe and many of their crews were killed. 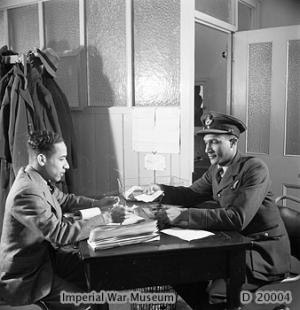 John Blair completed his full tour, received the DFC, and was then accepted into the Pathfinder force, but he transferred to Transport Command at the end of the war. He remained in the RAF until 1963, engaging in such activities as flying British casualties back from Malaya (he met his future wife Margaret who was a nursing sister on one such flight) and providing logistical support for the British nuclear tests in the Pacific. Uncle John passed away in 2004, back in his beloved homeland of Jamaica.